Gold remains one of the most attractive assets to load up on in the second half of 2017. Gold is glittering this September. In fact, everyone's favorite metal has been quietly rallying for the last couple of months, charging up to new 52-week highs alongside the stock market. But while stocks have been lingering just below their high-water marks for a while now, gold is the clear momentum winner this fall. That's because, while the S&P is up around 2% since mid-July, the popular SPDR Gold Trust (GLD - Get Report) has more than quadrupled that performance, up 8.3% over the same time frame. More importantly, that momentum isn't showing any real signs of slowing this September. Instead, gold looks like it could be in the early innings of a prolonged up-move. It's not surprising that gold has been gaining steam lately. The geopolitical environment has been shaky in recent months, between increasing tensions with North Korea and devastating hurricanes hitting the gulf. As tensions rise, gold is a major "flight to safety" investment for market participants who want to pare down their exposure to lofty stock valuations. 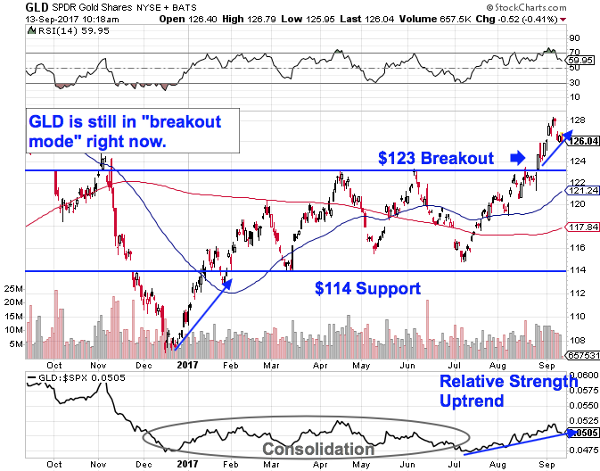 GLD spent most of 2017 stuck in a sideways range between support down at $114 and resistance up at $123. But that range-bound trading all changed at the end of August, when GLD definitively broke out above the $123 level, charging to new 52-week highs at $128.30. That move was a major buy signal for gold investors. What made the push through $123 so important? It all comes down to buyers and sellers. The $123 resistance level was a price where there had been an excess of supply of shares; in other words, it's a spot where sellers were previously more eager to step in and take gains than buyers were to buy. That's what made the breakout above $123 so significant -- the move means that buyers are finally strong enough to absorb all of the excess supply above that price level. From here, relative strength adds some important evidence to continue upside in GLD. Relative strength, the indicator down at the bottom of the GLD chart, has been holding onto a sustained uptrend since early July, making a series of higher lows in the intervening weeks. That uptrend tells us that GLD is outperforming the S&P 500 right now -- and, more importantly, it means that shares are statistically predisposed to keep on outperforming the big stock market averages into the end of the calendar year. As investors continue to pare down their risk in this market, gold remains one of the most attractive assets to load up on in the second half of 2017. This article is commentary by an independent contributor. At the time of publication, portfolios managed by the author were long GLD.